Now, I’m sure the person who did this had the best of intentions, but, honestly, if you have a column that says PDF and another that says Powerpoint do you really think a teacher needs to be told 50 times on the same page to click to download? Why do we need a title column to tell them the title that is already given TWICE for the pdf and PowerPoint? This is particularly discouraging because we have some really good content but you’d never guess it from glancing at that page. The thing teachers ARE is busy and they aren’t going to dig through your site looking for what is useful to them or putting it in order, they have enough to do. This is what the page looks like now, well, except for a few minor typos on this screen shot that I fixed later. You can click to check it out or you can read more and then click at the bottom of the page, because there’s more. 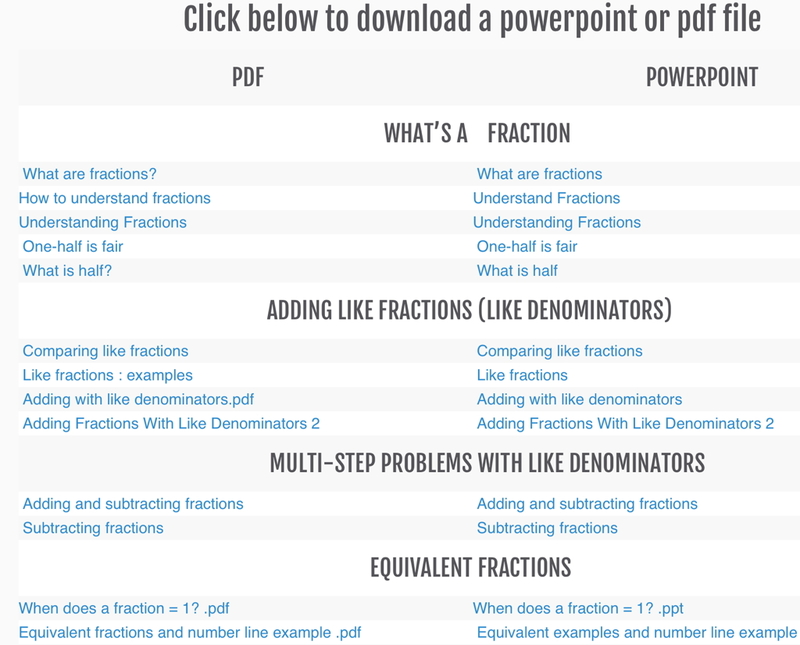 After several hours, the Fish Lake Teacher Resources page is really useful for anyone teaching fractions. Check it out. If you like the teacher resources, you’ll really like the game. Check that out, too.